Apart from our modern cityscape, Singapore also has a green side to it, teeming with natural wildlife. These nature reserves are free for you to explore, so grab your gear and explore some of Singapore's nature reserve trails! The Labrador Nature Reserve is home to mainland Singapore's last remaining coral reef. With beautiful views of Keppel Harbour and Sentosa Island, this place is also a hidden treasure full of surprises, with many historical relics left over from British colonial times and World War II. There have been discoveries of hidden tunnels here, with one of them even leading to Sentosa! The coral reef is home to beautiful marine animals, and you may even spot hairy crabs and horsehoe crabs! 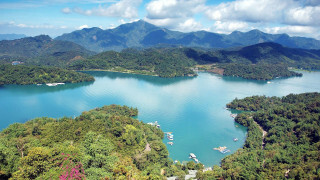 On land, you might be able to catch glimpses of animals as varied as the Malayan Monitor Lizard slithering along the ground, or the Black Kite gliding in the air hunting for prey. The Labrador Nature Reserve is part of the popular Southern Ridges Trail, which is 10km long and combines 3 beautiful parks. 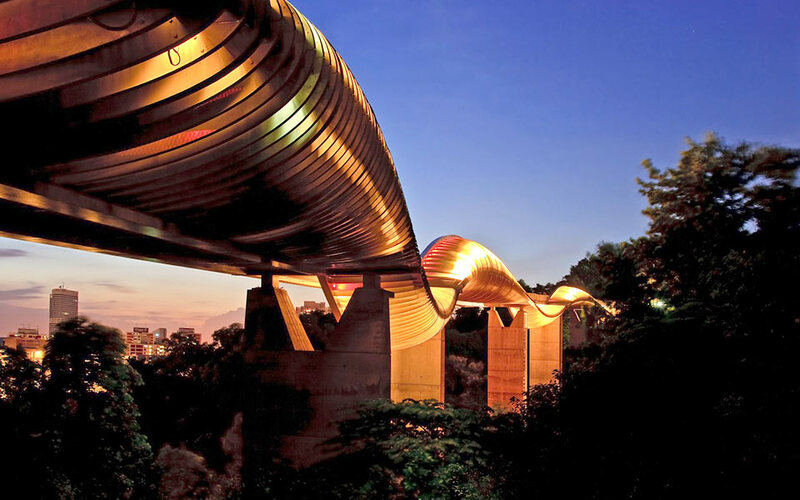 Along the way, you will cross the distinctive Henderson Waves Bridge. 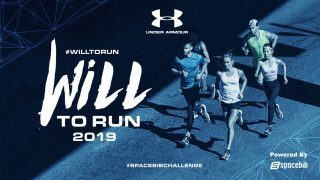 If you want to run, you can start at Labrador Park MRT Station and run within Labrador Nature Reserve too. If you want more mileage, head over to Keppel Island, which is open to the public! 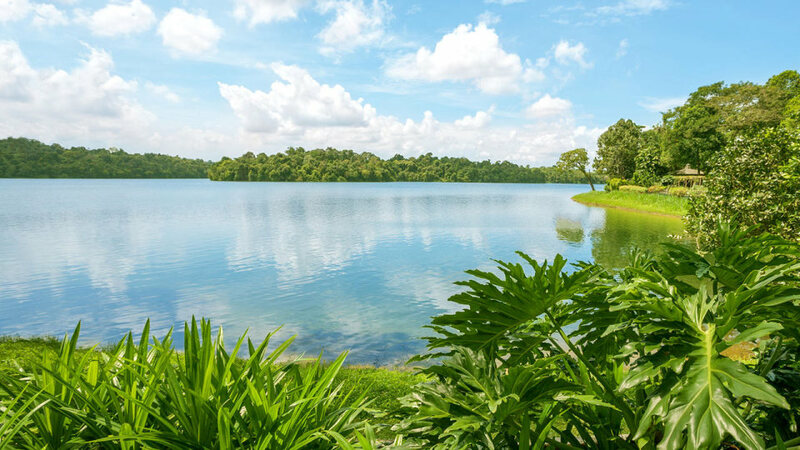 The "green lung" of Singapore, the Central Catchment Nature Reserve (CCNR) is the largest nature reserve in Singapore, covering a whopping total of 2,880 hectares! 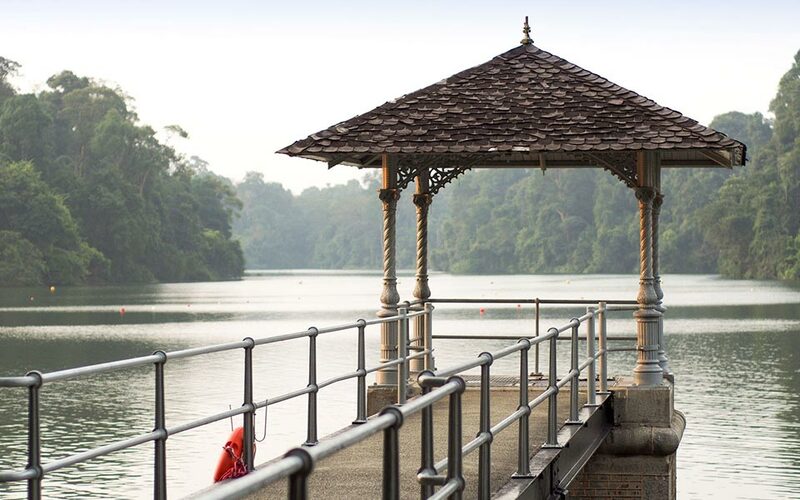 The most accessible portion of the CCNR would be MacRitchie Reservoir. 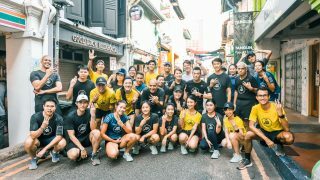 The challenging trails and the feeling of being close to nature make this a long-time favourite spot for runners in Singapore. There is a truly diverse and interesting mix of wildlife to be found. The adorable pangolin makes its home here, as well as the beautiful Collared Kingfisher, which has beautifully distinct plumage. Not only is MacRitchie Reservoir great for trail running, it also contains the HSBC Treetop Walk, which is a 250m long free standing suspension bridge that was set up to give you a look at the lush rainforest canopy of MacRitchie Reservoir. The bridge stands 25m tall at its highest point and is the first of its kind in Singapore. Definitely a must-visit destination if you love nature! The CCNR also houses the Singapore Zoo, the Night Safari, and the River Safari as part of its gazetted area. Recently, the Singapore Government announced plans to redevelop the entire Mandai Area, including relocating the 43-year-old Jurong Bird Park. While still in the early development stages, the redevelopment plans for the Mandai are pretty exciting. The government is planning the spruce-up to be similar to the likes of Gardens By The Bay, where apart from viewing wildlife, you can get to enjoy the waterfront and watch the sunset as well. With the popularity of the Safari Zoo Run in Singapore, might a full marathon be possible for this redeveloped area in the future? 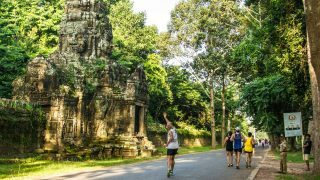 MacRitchie Reservoir is one of Singapore's more popular trail running spots, and we've previously covered a 10km running trail on it before. Give it a try! If you're visiting the Treetop Walk, please note that there is a one-way traffic system in place. Enter from the Bukit Peirce entrance via Peirce Track, and the bridge will end along the Petaling Trail. 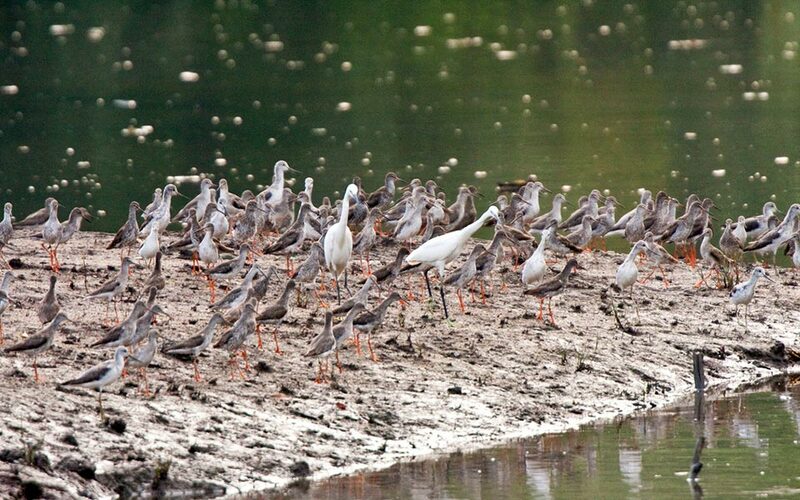 Sungei Buloh is a real treat for birdwatchers. During the migratory months of September to March, you can see migratory birds from places halfway round the world as they make a stop here, before heading to their final destination of Australia to escape the harsh winter months. The Ruddy Turnstone in particular, makes a tremendous migration from Siberia to Australia, stopping at Singapore for a brief rest along the way. If you're lucky enough to spot a Ruddy Turnstone here, do take the time to appreciate the fact that they probably flew over 6,000km from Siberia to Singapore. It still has another 4,000km to go before its final destination at Australia, making this an ultramarathon of an entirely different scale! A warning for nature-lovers: crocodiles have been spotted in this wetland reserve! If you spot a crocodile along the visitor trails, stay calm and back away slowly. Do not provoke them, as crocodiles are known to be aggressive! Gazetted as a Nature Reserve in 2001, the 130 hectares Sungei Buloh Weland Reserve is also part of the ASEAN Heritage Parks, a distinction it shares with the Bukit Timah Nature Reserve. Unfortunately, running is not allowed at the Sungei Buloh Wetland Reserve because of the potential disruption of native wildlife. But hiking is allowed, so bring your camera and follow this NParks guide to explore the wonderful mangrove habitat! The Bukit Timah Nature Reserve (BTNR) is home to at least 40% of Singapore's native flora and fauna, even though it occupies only 0.2% of Singapore's land area. It also contains Bukit Timah Hill, which is Singapore's highest point at 163.33m! With over 500 species of animals, it's no wonder Bukit Timah Nature Reserve is a popular place for nature lovers. Be fascinated (or horrified) by the Giant Forest Ant, which can grow almost 3cm long! The Greater Racket-Tailed Drongo, a distinctively beautiful bird which has two elongated outer-tail feathers with webbed tips. Due to erosion and other problems, NParks has closed the BTNR for restoration works. The main road trail leading to the summit of Bukit Timah Hill will be reopened on weekends to the public on March 2015, while the rest of the nature reserve will undergo a two year facelift. A great alternative would be to explore the Wallace Trail at nearby Dairy Farm Park. 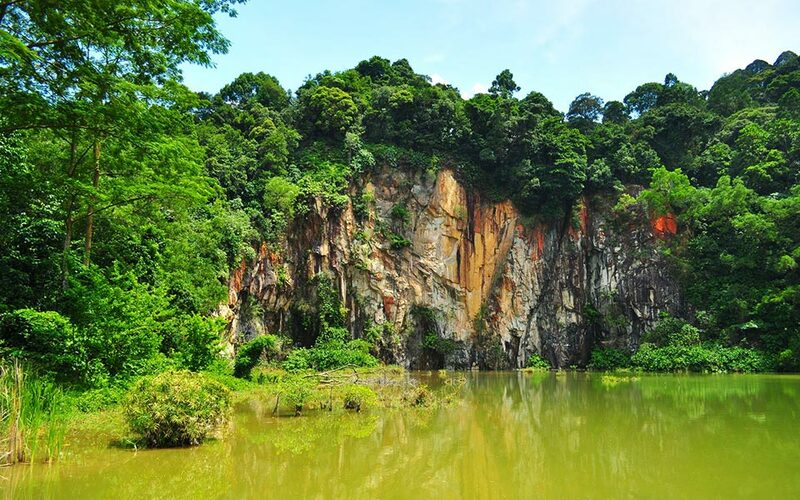 Be sure to soak in the view at the peaceful Singapore Quarry, which is at the southern end of the park. The quarry has been converted into a wetland, so you can see plenty of birds hunting for food on the surface of the water! If the Safari Zoo Run earlier this year reignited your love for wildlife, exploring these trails will definitely bring you closer to nature. Which nature reserve will you explore first?